Let your personality shine with perfectly paired gowns and accessories. Sweet accents highlight your flirtatious flair. Wedding gown by Amsale. Floral pearl headband by Jenny Packham. Pavé heart diamond earrings by Harry Kotlar. Heart minaudière by Whiting & Davis. Tip: When adding colored accents to your look, make sure they work with your wedding palette. Satin strappy sandal by Liz René Couture. Ladylike accessories enhance your classic look. Wedding gown by Carolina Herrera. 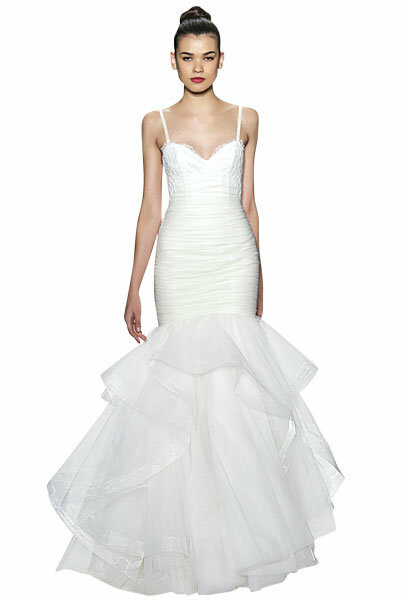 Check out more gorgeous dresses in our Carolina Herrera gown gallery! Satin clutch by Gunne Sax by Jessica McClintock for Kohl's. Swiss dot lace pump by Oscar de la Renta. Steal the spotlight in showstopping glittering accessories. Wedding gown by Kenneth Pool. See more gorgeous dresses in our Kenneth Pool gown gallery! Crystal necklace by T+J Designs. Crystal-accented silk pump by Badgley Mischka. Effervescent, whimsical accents befit your dreamy fairy-tale style. Wedding gown by Elie by Elie Saab. Check out more gorgeous dresses in our Elie Saab gown gallery! Organza floral haircomb by David Tutera Embellish. Satin bow clutch by Nina. Floral earrings by Jupiter Jewelry. Lace pump by Freya Rose.